Regression Therapy Is Good For. . .
And it can be used practically any time…. A client is having a reaction they don’t like. A client has a reaction that’s out of proportion to the current situation. A client shows signs of regression as they’re thinking about their problem (I’ll show you what signs to look for). If you don’t have effective regression techniques, you’re missing out on a valuable set of skills in working with people! When you think about it, regression can be used for a large percentage of the problems clients come to you with. If you’re not using regression, you may be missing a big piece of the puzzle.. And truthfully, a lot of practitioners out there are not confident using the regression techniques they have been taught. Why? A Lot Of Regression Training Out There Is Crap. How Do You Separate The Wheat From The Chaff? I’m a reductionist. I simplify–it’s what I do. And I’ve done lots of reading, studying and testing of various regression formats. But most of them left me dissatisfied. Often, there’s a lot of dogma and superfluous woo-woo attached. And if you look at the evidence behind the theories, there’s little support. So instead of fluff, I focused on what therapeutic processes work best. Then I started to look and what the most successful therapies had in common. I reduced, simplified, threw out the garbage and the unnecessary and came back again. Hone, simplify and hone again. And again. It’s called Hybrid Regression Therapy. It’s stripped down and free of spiritual or religious interpretations and light on psychological mumbo-jumbo. That means you can work with a wider range of people with a wide range of belief systems. It’s adaptable. If you have your own belief system about regression–these techniques can be used–put your own spin on them. It’s not ‘How to drum up memories’ a client thinks might have happened (it’s not a fishing expedition–it’s highly targeted). This is not your grandfather’s regression therapy. It’s not dogma nor filled with religious meaning–so it can be used with a variety of clients from multiple religious viewpoints. More potential clients means more success for you. 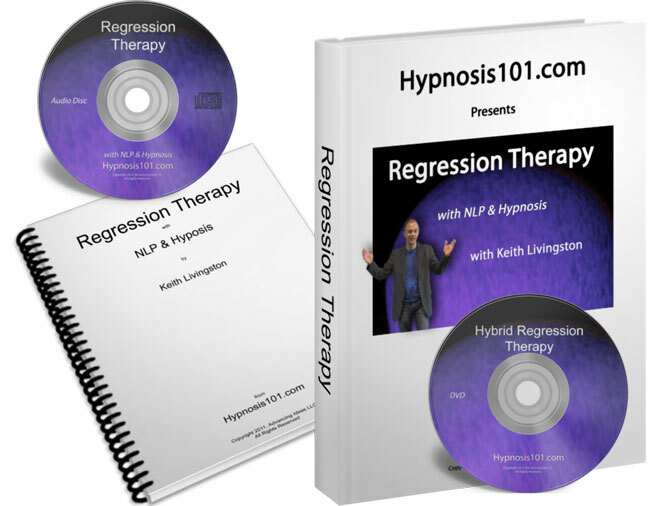 These techniques are not heavily based in formal hypnosis–it’s more NLP oriented (although you can use this style of regression in hypnosis). Why? Because it’s so easy to do! NLP training is not a prerequisite–I’ll show you exactly what to do. Simple, powerful quick and effective techniques to quickly find the root cause of a client’s problem, figure out what would help them resolve it and then resolve it. Plus, super-charged techniques to ensure that the change stays with them. And it’s all wrapped up with a pretty little bow for you in my hybrid regression therapy process. think regression is a deep, complex hypnotic phenomenon? Learn a simple, extremely fast regression technique that has most clients back at their “root causes” inside of ten minutes. But the part of the workbook that really gets me pumped up is–get this–the exercises! There are 8 simple exersizes in the workbook. 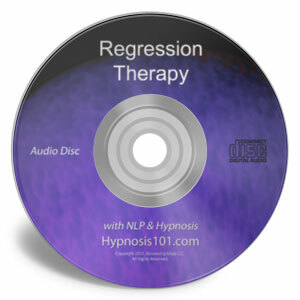 They’re designed to build your skill with regression therapy, bit-by-bit, building block-by-building block. This video shows me using regression therapy with a woman who is having an emotional response she doesn’t like, to a specific situation that occurs regularly in her life. See her responses as we add the resources to that past event that help her shift her perspective and shift the way she feels about all similar events that might happen in the future. In other words, be there as this problem is solved in her life! As I work with her, I explain as I go so you get the full benefit of both watching the session and having the explanations in the moment. Learn first-hand what to do when there are challenges and things don’t go strictly how they are supposed to go. The theories, the explanations, the step-by-step instructions are all covered in the audio CD. As you know, people learn best when presented with material in multiple sensory modalities and this CD helps do that. The CD expands upon and reinforces the DVD and workbook. This program will show you how to solve problems clients are having today by resolving events that happened in their past. And it will help you help them reliably, quickly and effectively. It will have dramatic, positive effects on your client’s lives. It’s impressive, modern, fast and effective. Learn what resource states are and what they’re used for. Learn many of the differences between Dave Elman’s approach and Ericksonian techniques. 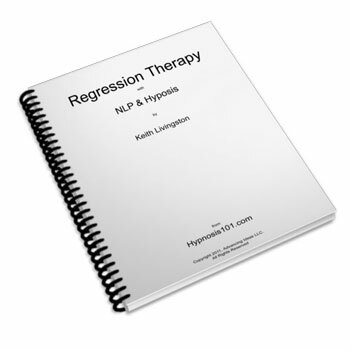 Learn the core concepts of regression. Learn how the past affects us in the present. Discover how the unconscious attaches negative emotions to contexts. Uncover the secret reasons that logic is ineffective in battling these negative emotions. Learn how, when a client is experiencing a negative emotion, they may already be regressed! Find out why insight based therapies are largely ineffective in dealing with client issues. Learn a process that helps you solve client’s current problems by resolving events that happened in their past. Shipped to your door. One DVD, one audio CD and a comprehensive workbook.